One of my blogging homegirls, Molly from My Name is Yeh, is getting married later this month! And this is her wedding pie!!! Okay, let's backtrack here for a second. Who is Molly? And what is a wedding pie? Well, unless you've been living under a rock this past year, you probably know Molly Yeh, right? 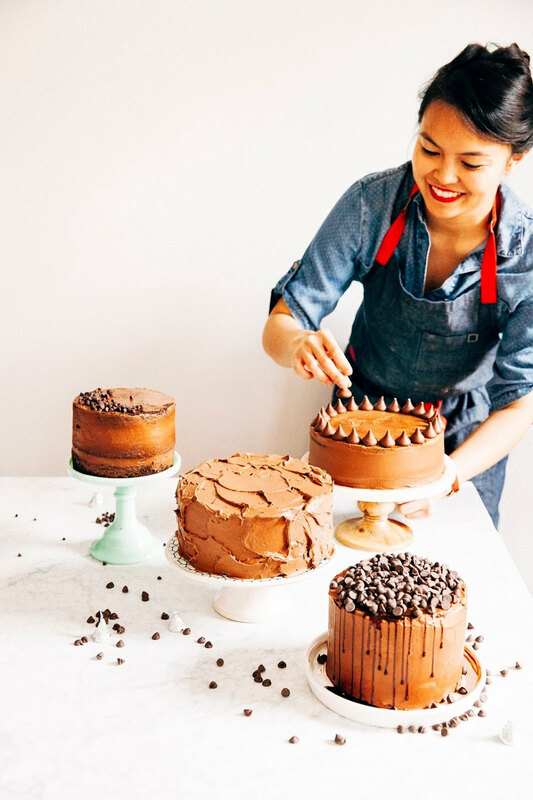 This past year has been THE YEAR OF MOLLY YEH, and she's been popping up everywhere from the New York Times to Cherry Bombe Magazine to Food52 and literally everywhere else. In the age where food blogs are a dime a dozen, her blog really stands out amongst us all — her photos are always, always so gorgeous, her recipes so creative and fun (I mean... look at these dinosaurs on this Italian cookie cake and ohmygawd these gingerbread TERRARIUMS) and it's so fun and exciting to read about her adventures going from living in the big city to a small farm in North Dakota. And now, after a surprise engagement this past summer, she's getting married in just a few short weeks! 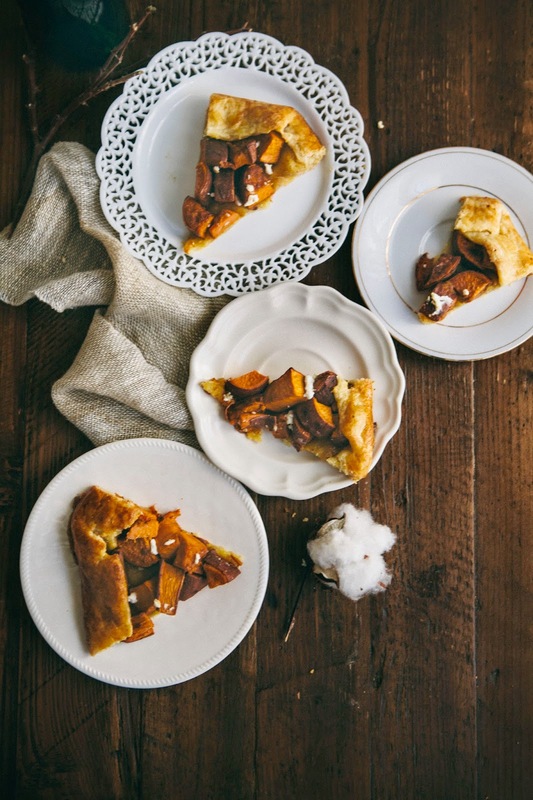 To help celebrate the occasion, Molly asked me and a few other food blogger friends to come up with a wedding pie recipe that she and her mom will be baking for the special occasion. This is a recipe I developed specifically for the occasion for the future mr. and mrs. egg. Since it's going to be a winter wedding, I knew that I wanted to make something that was seasonal and hearty and comforting. For me, sweet potatoes automatically came to mind. They've have always been one of my favorite winter comfort foods (Have you guys ever had mashed sweet potatoes with orange zest, brown sugar and brown butter? I could eat bowls and bowls of that stuff). After some online stalking like a creeper, I was pleased to find that Molly appears to think the same, considering that one of her favorite foods is sweet potato tempura rolls and that she thinks sweet potatoes are the best part of Thanksgiving (which I heartily agree with, despite the unfortunate omission of sweet potatoes from my Thanksgiving table this year). Now, I wish I could say that I came up with the most epic and delicious combination of sweet potatoes, maple syrup and cumin all by myself but the concept is actually stolen from Tasty n Sons, one of my favorite brunch places in Portland that does this really awesome maple and cumin glazed yams as a side to their egg dishes. I thought it would be a fun way to incorporate a little bit of Portland's own whimsy into Molly's undoubtedly whimsical North Dakota farm wedding. I baked the maple and cumin tossed sweet potatoes on my trusty cornmeal crust (also seen in this goat cheese and Concord grape galette and this plum and marzipan crumble galette), whose snappy and almost slightly crunchy texture complemented the softened sweet potatoes wonderfully. And to top it off, I tossed a few goat cheese crumbles on the finished pie to give each slice little bursts of creamy umami here and there. It's not quite a main dish on its own, but it's a nice galette to have as a vegetarian side accompaniment to other plates. So CONGRATULATIONS, Molly! I hope you and eggboy have the most wonderful wedding!!! Can't wait to hear about it! Sending you guys love and best wishes all the way from Portland!!! You can make the galette dough up to a week in advance, as long as you keep it tightly wrapped in plastic in the refrigerator. The dough can also be frozen for up to 1 month; thaw overnight in the refrigerator before using. Unfortunately the galette as a whole does not freeze well because of the maple syrup in the recipe — I'm worried that the maple syrup would likely crystallize as it freezes, and will be grainy after it thaws. You can, however, make ahead and refrigerate several of the recipe's components (that is, the dough, the sweet potatoes before they're tossed in with the butter and maple syrup) before throwing it all together on the final day to save time. I wrote the recipe for the cornmeal galette dough the way I made it, which was using a food processor. 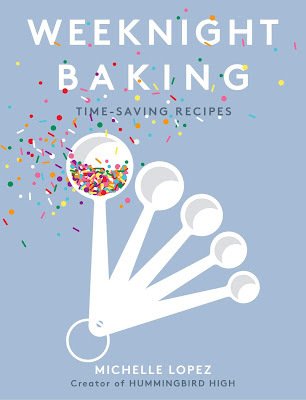 I know that not everybody has a food processor though (and to be fair, I only got my food processor pretty recently), so you can also cut the ingredients together using a pastry blender, two knives, or even your hands. Combine 1 cup all-purpose flour, 1/4 cup cornmeal, 1/2 teaspoon kosher salt and 1/2 teaspoon granulated sugar in the bowl of a food processor. Pulse several times to combine, before adding 1/2 cup cubed cold unsalted butter. Process until the mixture resembles coarse meal, about 10 seconds — at this point it's actually desirable to have a couple pea-sized butter cubes in the mixture. Anything beyond that will make your dough a little hard to work with. With the machine running, pour 1/4 cup ice water through the feed tube in a slow steady stream, until the dough just holds together. DO NOT PROCESS FOR MORE THAN 30 SECONDS, or your dough will be over-kneaded and hard to work with! Lay out a large piece of plastic wrap on a clean work surface. Turn out the dough onto the plastic wrap, and work quickly to bring the dough together into a small mound, handling it as little as possible. When you've got a mound (it's okay to have a couple stray pieces), wrap the plastic around the mound. Flatten with the back of your palm and refrigerate for at least 1 hour before using. While the dough is chilling, make the sweet potato filling. Preheat the oven to 400 (F). Prepare 2 medium-small sweet potatoes by cutting into 1/2-inch to 3/4-inch chunks, leaving the skins intact. In a baking pan, toss the sweet potato chunks with 1 tablespoon grapeseed oil and 1/4 teaspoon kosher salt. Bake in the preheated oven for 20 to 25 minutes, until the sweet potatoes are tender but still firm-ish in the middle (sticking a fork in a sweet potato chunk should still offer some resistance). Transfer to a wire rack to cool slightly while you prepare the rest of the filling and roll out the dough. Be sure to leave the oven on. In a small saucepan, combine 3 tablespoons unsalted butter and 3 tablespoons maple syrup. Melt over medium heat, whisking occasionally until the butter is fully melted. Once the butter is fully melted, pour over the baked sweet potato chunks. Sprinkle 1 teaspoon cumin evenly over the sweet potato chunks as well, and use heat-proof rubber spatulas to toss the sweet potatoes around until fully coated in melted butter, honey and cumin. Set aside on a wire rack while you roll out the dough. Dust a clean work surface with a combination of all-purpose flour and cornmeal. Roll out the chilled cornmeal dough to a 12-inch round, about 1/8 inch thick. Transfer the dough to a large, parchment-lined baking sheet. In a small bowl, whisk together 1 large egg and your remaining 1 teaspoon maple syrup. Have a pastry brush ready for brushing the dough edges with this egg wash. 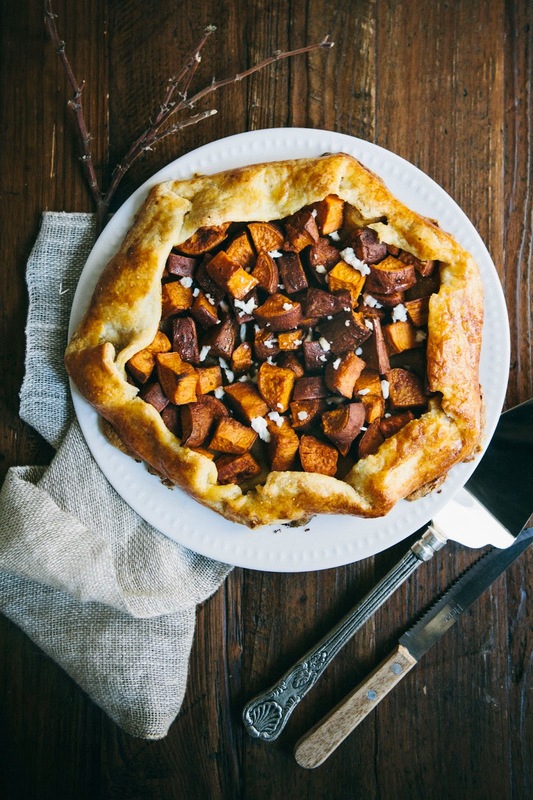 Working quickly (especially if your sweet potato filling is still warm), transfer the sweet potato filling onto the prepared galette dough, arranging the sweet potato mixture in the center of the rolled out dough but leaving a 2-inch border all the way around the circle. Fold border over the sweet potato mixture, overlapping when necessary and pressing gently to adhere to the folds. Use a pastry brush to brush the crimped border of the galette with the beaten egg. Sprinkle 1 tablespoon maple sugar evenly over the egg wash, and transfer to the preheated oven. 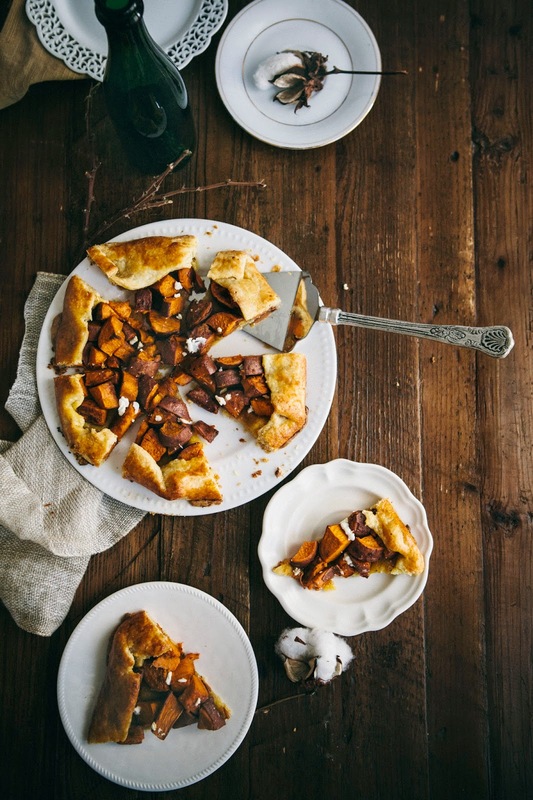 Bake until the crust is golden brown and the sweet potatoes have fully softened, about 30 to 35 minutes. 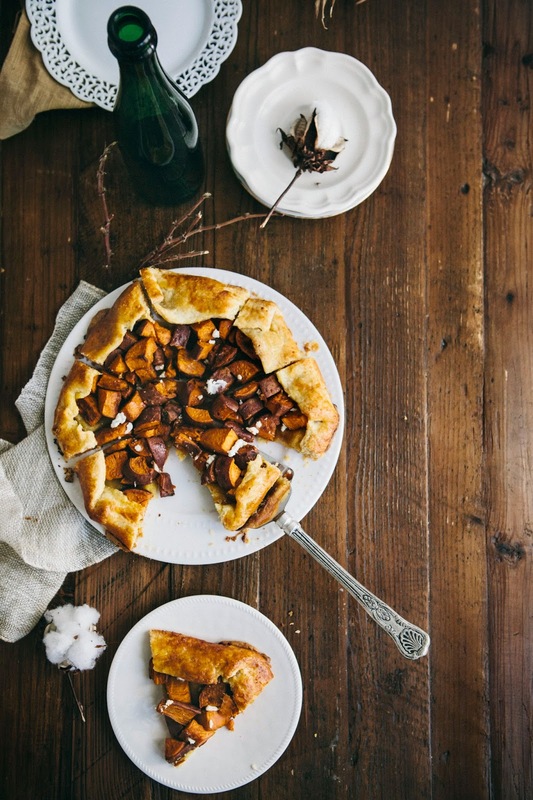 Remove the galette from the oven, let stand on a wire rack for five minutes, then slide onto a serving plate. Use your fingers to crumble 1 tablespoon of goat cheese evenly over the surface of the sweet potato filling. Cut into wedges and serve hot, warm or at room temperature. It's good either way, but the center of the galette will start to get soggy if left overnight. love this. love molly. you're great. sweet taters and maple and cumin sounds badass! Great combo and sounds delicious! Pretty sure this is on the healthy side of the pies. Also, LOVE the nice touch of cotton flowers, real subtle yet complementary. This looks and sounds lovely. Just perfect for a winter wedding :). Right?! Sweet potatoes are one of my favorite winter foods. Thanks Marta! Also, I just love your blog!!! Your crust looks perfect! And the touch of goat cheese is inspired. I'm totally making this for my vegetarian sister over the holidays. Yes! I hope she likes it! This looks stunning, well done. Always know I can come to you for some food inspiration. Aww thank you! You're making me blush! Woohoo for wedding pie! Love the combo of flavours in this and that sprinkle of goat cheese. Definitely a pie fit for the egg-wedding. Yum! What a gorgeous wedding pie! Lucky Molly! 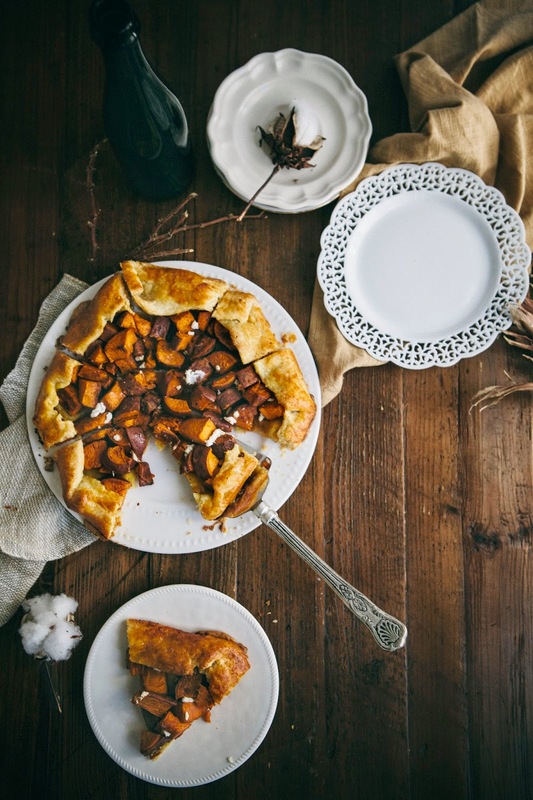 I'd eat this pie on my wedding day -- or any day, for that matter! This bad boy is perfect. 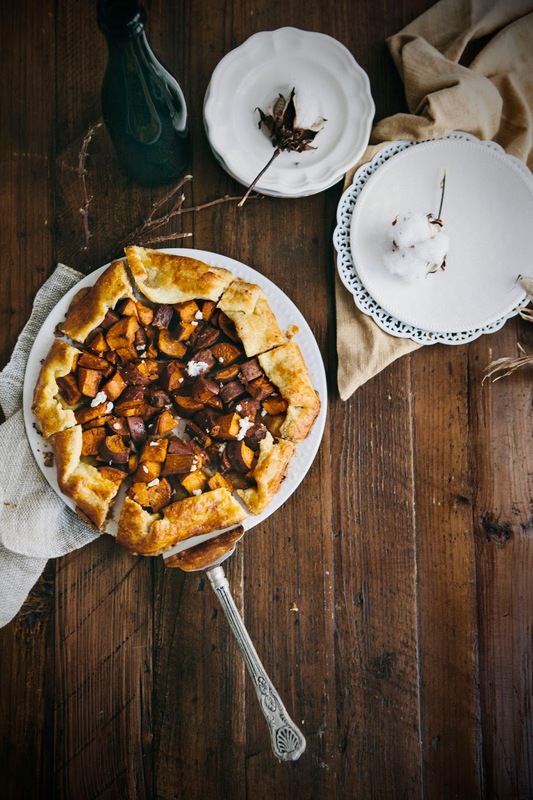 A cornmeal crust with maple-cumin sweet potatoes and goat cheese? Yep. That needs to happen. Yesss, the more weddings this pie is in, the merrier! I love the style of this shoot, haha is it bad to not comment about the food?! It is such a pretty setting! Not at all, sometimes it takes me longer to style the shoot than to bake. No, really. So I sincerely appreciate the compliment! Made this tonight. So so good. I'm already thinking about the next time. Boyfriend and I feasted over a halved version, and think a bigger one would be great for a gathering. Ahhh, so glad you liked it!!! You can double the recipe pretty easily and make 2 galettes for a bigger crowd.